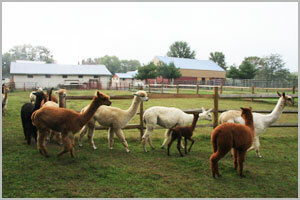 Scotia Acres Alpacas is a full service alpaca farm. Our goal is to provide customers with a rewarding experience from farm visits, to the purchasing of alpacas. We strive to provide ethical and honest business standards along with a full guarantee of satisfaction. Alpacas boarded at Scotia Acres are provided quality shelter and pasture, health care, a safe environment with an experienced veterinarian on call and networked with leading camelid health experts. It is an effective way to own alpaca without the day to day care for those wanting to build their own herd or merely because alpaca are a good investment. Boarding fees are tax deductible. Demand for alpaca fiber continues to grow. Fleece harvested each year can be sold individually or through a fiber coop. The coop offers a guaranteed outlet for the fiber and promotes an awareness of the alpaca fiber in the fashion world. An alternative to selling the raw fiber, is to have it turned into yarn and sold directly to consumers. Compared to other livestock, alpacas are inexpensive to own. Once animals are purchased, they can be depreciated over five years. The maintenance costs are minimal and alpacas are fully insurable. Your modest premium costs will protect you from catastrophic loss of animals and capital in much the same way the FDIC covers your savings at the bank. Only your investment returns should be much higher with alpacas. Exciting and proven tax savings are another integral part of the investment value inherent in alpaca ownership. While these apply only to breeding animals and the infrastructure needed to maintain them, over 25 established avenues for tax savings are available to you as an investor in alpacas. Depreciation on purchased breeding alpacas, structures, machinery, equipment, and other items whose useful life extends to more than one year. Complete write-off on many maintenance expenses, such as feed, veterinary fees, electricity for the barn. Deferral on capital gains through utilization of the compounding plan which shelters profits until the alpaca is actually sold. As in any business venture, you are urged to consult with a qualified accountant before making an alpaca purchase.